A telephone network is a telecommunications network used for telephone calls between two or more parties. A fixed-line network, where phones must be connected directly to a telephone exchange. This is known as the public switched telephone network PSTN or. A wireless network that phones are mobile and can be moved anywhere within the coverage area. A private network, where a closed group of phones are mainly connected to each other and use a gateway to reach the outside world. This is usually used inside companies and call centers and is called private branch exchange (PBX). Public telephone operators (PTO) own and build networks of the first two types and provide services to the public under license from the national government. 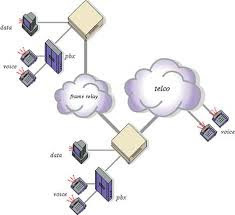 The virtual network operators (VNO) rent capacity wholesale PTOs and sell telephone service to the public directly. Set of interconnected elements if one or more nodes can receive / transmit information, share resources and service users. Networks that allow this are advanced and complex equipment. Its effectiveness is based on the confluence of many different components. The design and implementation of a global communications network is one of the great 'technological miracles' of recent decades. Until recently, most computers had their own interfaces and had its particular structure. A team could communicate with another of the same family, but had great difficulty doing so with a stranger. Only the most privileged have the time, skills and equipment needed to extract different information resources that they needed. In the 1990s, the level of agreement between different computers reached the point where they could efficiently interconnect, which allows anyone to profit from a remote computer. The main components of this process are client / server systems, object technology and open systems. In practice the open system concept decoupling results in all components of a similar system used in all other structures. This entails a mixture of standards (which indicate that manufacturers should do) and associations (groups of related entities to help them do it). The final effect is to be able to talk to each other.